The original idea was published in "Rational Recreations" (Hooper, 1784). When Harry Potter came along Rachel was able to give it a perfect children's theme. You begin by asking the audience where do Harry Potter and his fellow students go to buy their school supplies before the term begins: Diagon Alley. To get there you have to go to the Leaky Cauldron Pub in London, go out the back door to a brick alleyway. Tap on the brick with your magic wand. Magically an opening appears. This is the entrance to Diagon Alley! 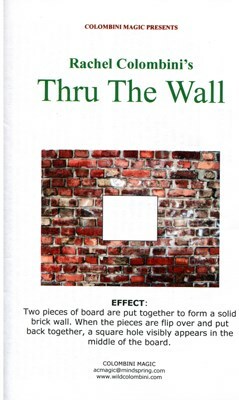 And it is exactly what you show: Two pieces of board are put together to form a solid brick wall. When the pieces are flipped over and put back together, a square hole visibly appears in the middle of the board! Easy to do, you can do it while you are sleeping!